The team had members on the opposite side of the developer experience spectrum; 1 Kean senior with years of experience and 3 high school students with little to no experience. As a team we needed an idea that we can all follow along with and explore around. Using the A-frame framework was the perfect middle ground as we were able to use it to make a fun simple VR experience on the web. With the years of experience, William Francisco was able to explain the framework along with the basics of web development. 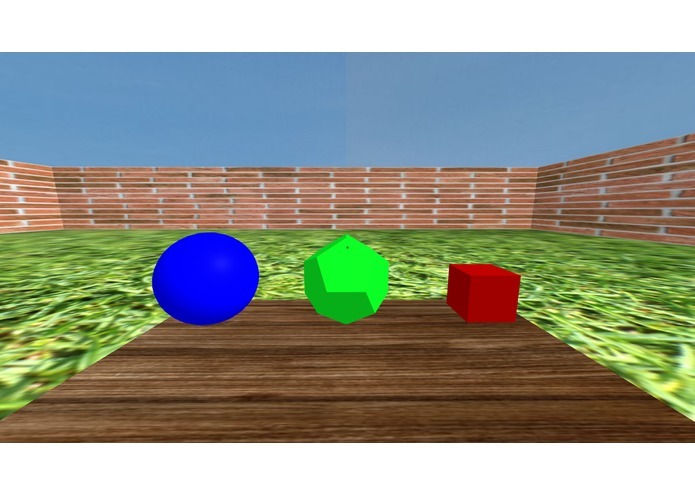 The project is a basic Web VR scene that can be run on any browser rather it be in desktop or on mobile. The user Spawns in and in front will be a table with 3 items on it, the user can collect the items but gazing at them. Each item provides feedback that it is being interacted with. The A-frame framework is used withing a HTML document. We used the API for guidance and examples along with a series of video tutorials on the framework. some of the videos used an older version of the framework with features that were deprecated in the most recent version of it so we ran into issue with debugging. The high school students were able to understand the code and follow along. We learned the basic of web development, along with how to implement an API. The item collection is the stepping stone to a full inventory system with multiple items in the scene, with further interactions and animations. On this project, I edited some parts of the HTML code using Subline, as well as adding some lines of code.